June’s issue (no. 33) contains the final book in my series celebrating the 800th anniversary of Magna Carta. The culmination of this series contains the three foundations on which much of Britain’s constitutional fabric rests: Henry I’s Charter of Liberties which restored many of the ancient rights from the Saxon period, which had been usurped by his father and tyrannical brother William Rufus. 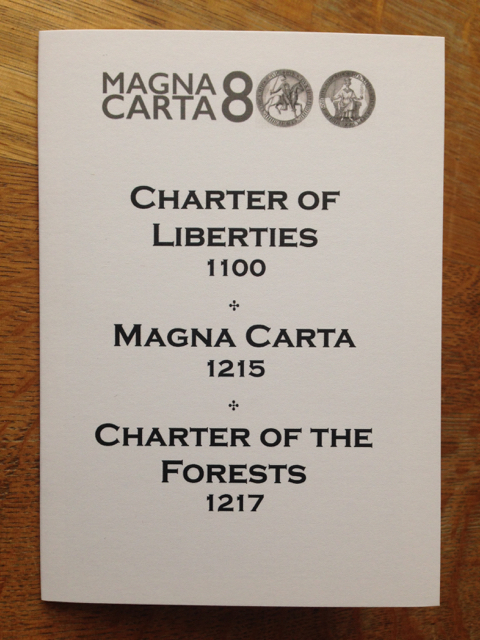 This provided much of the basis of the Magna Carta itself, issued by John at the behest of 25 English barons. Later versions issued by his son and grandson extended its protections to all freemen, not just the barons named in the original. Parts remain in statute even until today. Often overlooked, but much more significant for ordinary people, the Charter of the Forest was issued in 1217 by John’s son, Henry III (or rather, by his regent William Marshall). It reestablished the right to forage for food, collect firewood, graze animals in lands deemed Royal Forest. It remained in statute until repealed and replaced by the 1971 Wild Creatures and Forest Laws Act. As the book was being typeset the newly elected Tory government announced plans to replace the 1998 Human Rights Act with a new British Bill of Rights. Quite what this means remains to be seen. If you’d like a complete set, we have a small limited edition available to buy here. Like what you see here? Then treat yourself to something lovely – an enigmatic, eclectic package arriving through your letterbox each month. Or buy a gift subscription for someone special. Get inspired to create and share your own publications on bookleteer to take part too – each month I select something delightful and inspiring from the publications which are made and shared on bookleteer.